FirstBuild, a global co-creating community by GE Appliances, recently signed a Memorandum of Understanding (MOU) with the state of Telangana and prototyping centre T-Works to establish FirstBuild India in Hyderabad. FirstBuild India would be a sort of hardware incubator, which would aim at bringing smart products and appliances to market through open product innovation by engaging India's growing maker community. The MoU, according to a release by the company, is in continuation to the agreement signed in December last year, where both sides created a task force to work out the details. "This marks the beginning of a new partnership between the state of Telangana, T-Works, India's largest prototyping centre and FirstBuild, a global co-creating community backed by GE Appliances." The agreement was signed by Sujai Karampuri, Chief Executive Officer of T-Works, where FirstBuild will be located and Chandramouli Vijjhala, Chief Information Officer for GE Appliances India. "The new creative centre is one of a kind in the Hyderabad region, where budding creators will find an open community focused on building a new generation of appliances that transform the home. As the country's largest makerspace, T-Works is the ideal location for FirstBuild India to begin its journey," says Cook. Besides India, FirstBuild is present in other locations such as Louisville, Kentucky, which opened in 2014 and in Shanghai, China, which opened in 2017. Inside the T Works facility, FirstBuild India will occupy 8,000 square feet of fabrication space dedicated to developing the appliances local consumers. "Creating the culture of hands-on making and creating is necessary to fulfil the 'Make in India' vision and to take India into the fourth Industrial Revolution as a leader, not merely as a follower," Sujai said. "The infrastructure that Telangana State is building at T-Works is one key step in that direction. 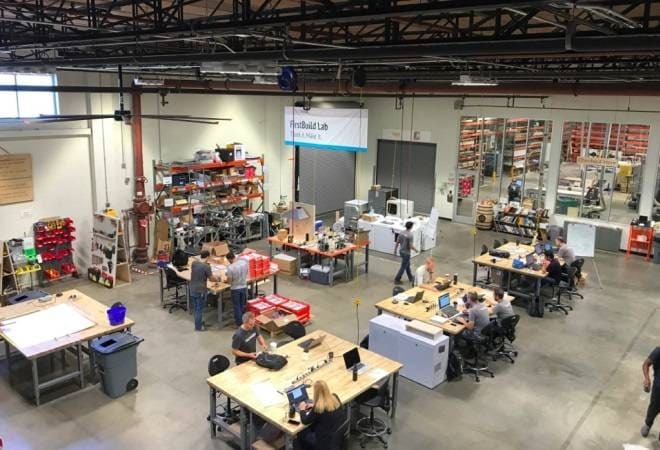 "The partnership with FirstBuild, will help the makers productise their innovation by combining their innovative ideas with the manufacturing prowess of GE Appliances' FirstBuild." FirstBuild's location in India, aims to mirror the success of the centres of excellence in the U.S. and China. The company, with the help of its thousands of online community members, fast-tracks promising appliance concepts, adopts the most popular ideas and builds products in small batches. FirstBuild India is to begin operations early next year and the company says, will be staffed by associates working alongside designers, programmers, students, craftsman and other makers and doers to not only design, build and sell appliances, but attract and nurture an even stronger community of inspired individuals.